I arrived in New York City, via John F Kennedy airport on 28 January 2017 around 11AM. Unbeknown to me, at almost the same moment, President Donald Trump issued a ban on all refugees coming into the United States for the next four months, suspending the current programme, and banned all citizens of seven predominantly Muslim countries for the next three months. Later, CNN reported that this would potentially affect an estimated 218 million people. When I arrived in New York, customs officials questioned if I’d been to Iran, Iraq, Somalia, Yemen, Libya, Syria or Sudan and I thought better of saying anything chipper. “I am so keen to travel to Iran. So many writers I know have loved the people and country,” would have been my response to anyone else asking. I was also questioned about where I live and where, precisely, Cape Town is located. This line of questioning was different to my previous experiences and the last time I was in the city was a mere six months ago. In a cab on the way to Midtown, I’d learn that an executive order was made, barring even green card and valid visa holders, including academics, students, researchers and official state translators from entering the United States. Those who were abroad were left in limbo; a reported 150 or so were denied entry onto flights entering the U.S and at least a dozen people were held in detention at various airports for more than 10 hours, in some cases. American friends and fellow journalists rallied for support for next-day countrywide marches opposing these clearly unconstitutional and autocratic bans. Calls looped through social media feeds to donate to the American Civil Liberties Union (ACLU). The ACLU, a non-profit organisation that specialises in defending the Constitution and individual liberties, had been labouring tirelessly (and they still are), along with lawyers from independent firms who were donating their time, to oppose the ban. Images of lawyers sitting with open laptops on the floors of various airports and translators with makeshift signs offering their services pro bono, circulated widely. On Saturday evening Federal Judge Ann M Donnelly ruled a stay on the Muslim and immigrant ban. Acting Attorney General Sally Q Yates appealed to state prosecutors not to defend President Trump’s ban and was given walking orders in retaliation soon after, in what has been deemed the “Monday night massacre’, after a similar situation with President Nixon that occurred on a Saturday. It’s crucial to note that in healthy, well-functioning democracies there must be a separation of powers between the judiciary, legislature and executive powers for checks and balances to occur. We’ve had similar situations in South Africa where President Zuma’s actions have been called to book by the Public prosecutor; no man nor president can or should be above the rule of law. 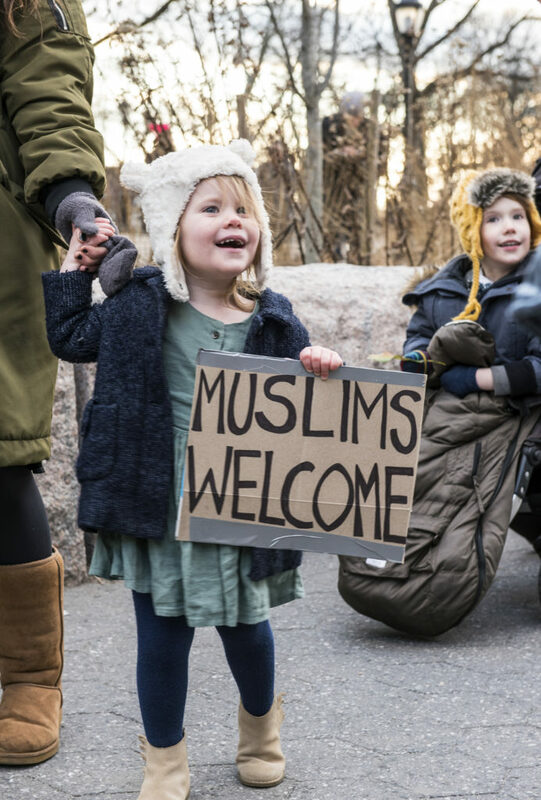 In reaction to President Trump’s Muslim and immigrant ban, dissidents took to the streets, some in sleet and inclement weather, on Sunday 29 January in peaceful, organised marches. 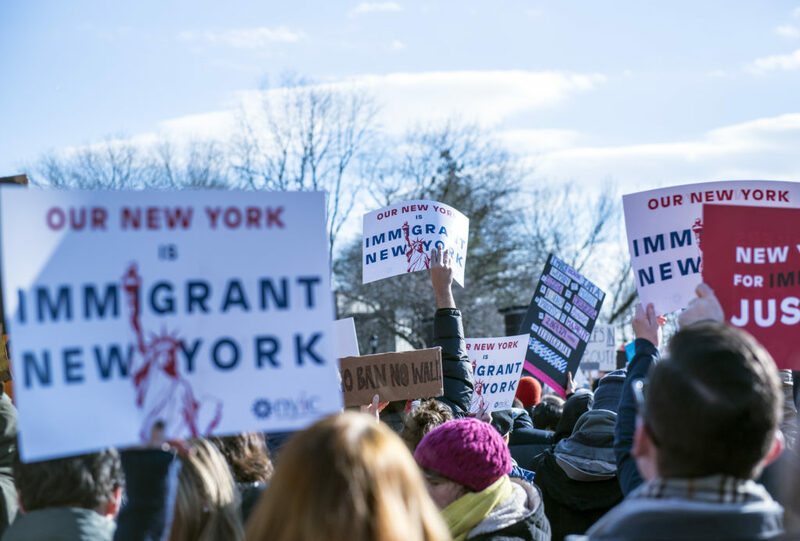 Aware of the obligation to remain objective and the oft-precarious line we tread as journalists, I decided to join Make the Road New York, an immigrant representation organisation that mobilised New Yorkers and visitors into action. I did it as a brown-skinned foreigner to place on record my dissatisfaction and abject horror at what has been unfolding. Many have said the President is merely delivering on the promises he made during his campaign – to isolate Islam as the religion of terrorism, to build a wall keeping Mexicans out, and, to quote his campaign catchphrase: “Make America great again”. 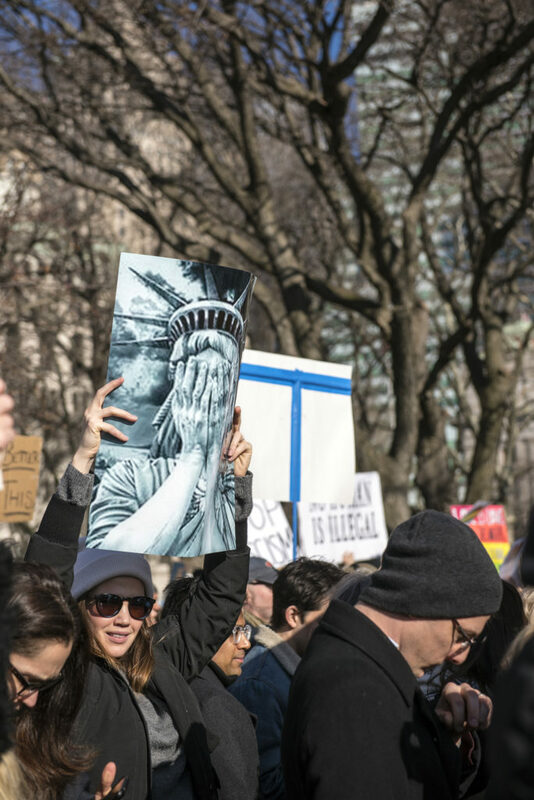 Several protestors countered that America has been composed of immigrants since it was founded, including the President’s mother and the First Lady. I marched in protest as a moral objection to myopic actions I know to be steeped in bigotry (several political analysts have called President’s Trump’s rhetoric and reactionary rulings a “gift” to extremists.). After rousing speeches from successful New York City immigrants, city councillors, Mayor Bill de Blasio, advocates and lawyers, I marched with an estimated 30 000 people from Battery Park to Greenwich. 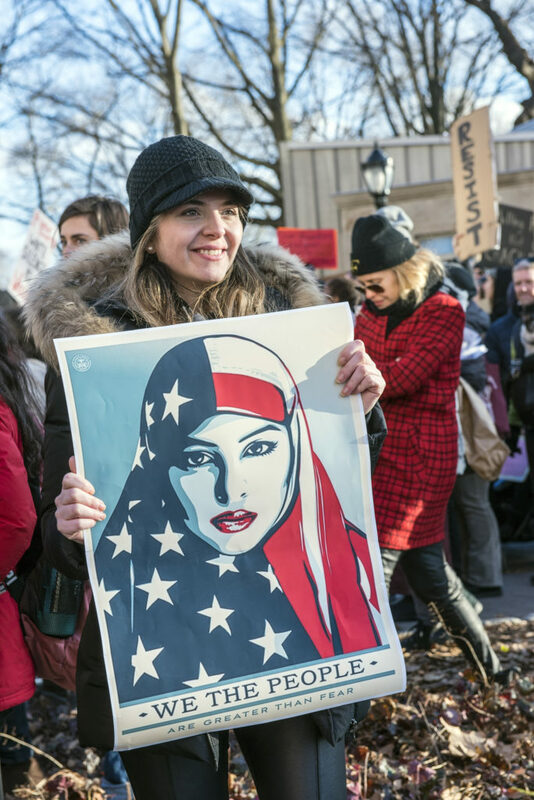 Many carried heart-wrenching homemade posters and we chanted: “No wall, no fear, immigrants are welcome here” in direct opposition to President Trump’s draconian and divisive actions. I did it to mark my dissent, and my belief that we are capable of being counted, particularly those of us who move through borders (for work, or otherwise), enjoying the benefits of a global community. No human is illegal, being the compassionate viewpoint of many protestors. “Which of us is next?” one poster implored while others were stark reminders of the inaction of whole communities across the world while the Jewish Holocaust was enacted. Signs and chants appealed to our collective humanity. I marched, too, on behalf of black, brown, women and queer travellers who, under the current administration and the growing fascist sentiment in Europe and the rest of the world, have never been more vulnerable. Well, perhaps, we have been, but this time we won’t be silent. I’ve been made aware that the Trump administration has acted out what is known as a “shock event” – one that unsteadies the ground, divides the masses and allows those in power to attain their real goal by sleight of hand. I believe whatever this goal is, we may never actually be fully prepared for it. But, I marched against injustice and in the belief that understanding civic rights will make the difference between dangerous, unchecked governments and healthy, well-functioning democracies. In America, in South Africa and hopefully, across the world one day.